I enjoyed the first two books in “The Expanse” series, but I did feel that the second book felt a bit like a partial retread of the first book and didn’t add many new ideas. Fortunately, “Abaddon’s Gate” makes up for that by bringing in some welcome new ideas and plotlines. The book opens with a fleet of ships from the solar system’s various rival powers (plus, inevitably, the crew of the Rocinante) warily investigating a strange structure the alien protomolecule has constructed in the outer reaches of the solar system. The object is clearly a giant gate to some other place but where it leads is unclear and the various ships are reluctant to make their way through but the narrative demands that they end up venturing through even if the way it happens is a bit unexpected. James Holden and the crew of the Rocinante have other ideas and would rather be anywhere else but someone in the fleet with revenge on their mind hatches a plan that forces them through the gate. I’ve always had a fondness for Science Fiction novels involving exploring the unknown and this is a good example of the subgenre. Initially it’s impossible to know what they’ll find on the other side of the gate but some (although not all) of its mysteries are gradually revealed through the book. 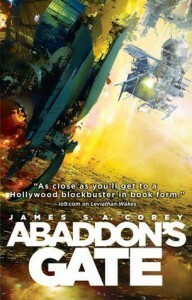 One of the main strengths of the book is how the different factions- Earth, Mars, the Outer Planets Alliance and Holden’s crew – are all mutually out of their depth and as they face an increasingly desperate struggle for survival in a hostile environment they are forced to work together despite in some cases having recently fought a war against each other. Even in such a situation some of the people on the ships can’t stop scheming and trying to dominate their rivals leading to some tense and claustrophobic scenes as a battle begins for control of the fleet. Thankfully there’s no corporate conspiracy to develop new weaponry or a search for a missing person, those were plotlines that worked very well in Leviathan Wakes, but after the similar plotlines in Caliban’s War it is nice to see a completely different plot. There are plenty of ideas and plenty of action in the book, but the strongest element is probably the characters. The crew of the Rocinante continue to be entertaining characters to follow, even if Holden’s conviction that he always knows the right thing to do can sometimes get irritating for both the other characters and the reader. The vengeance-obsessed Clara is an interesting antagonist, particularly when she becomes increasingly conflicted about what she is doing. After the cynical greed of the villains in the first two novels she is a good having contrast, since she has clearly been unhinged by some traumatic events into becoming fixated on punishing Holden and his crew for their perceived transgressions, and she experiences the most character development as she gradually becomes more aware of the consequences of her actions. Sadly, there’s no return for Avasarala, the best character in the previous book, but the two other new point of view characters are both interesting. Methodist pastor Anna might challenge Holden in terms of the strength of her conviction about doing the right thing but unlike Holden she does try to persuade others to her point of view and I think she is a another compelling character, particularly as she tries to take a role of mediator as the situation becomes increasingly chaotic. Like Avasarala she’s a good example of how a character can shape events by influencing the people making the decisions, although she is sometimes forced out of her comfort zone into taking action herself. The final major new character is the OPA’s security chief, Bull, who is in some ways a successor to Miller from Leviathan Wakes, a character who is trying to fulfil his mission and protect his ship even if it means he has to do some hard and ruthless things. There are also a number of interesting supporting characters, although one who ends up being one of the main antagonists to Holden and his crew does develop into a bit of a caricature. Overall, I think this is an excellent piece of Space Opera that’s the best novel in a series that was already good.